Posted in Bright Ideas / Blog on December 6, 2018. Editor’s Note: This post was originally published on Nov 2nd, 2018. At the time, there was some confusion over what the ‘Branded Searches’ metric in Google My Business Insights actually meant. Our contributor, Brandify’s Damian Rollison, and Sterling Sky’s Joy Hawkins, received different explanations from their Google contacts, resulting in Joy posting a thread on the Local Search Forum with her explanation. Damian has since received clarity from Google on this relatively new metric, and has kindly provided an update to this post, which we’ve included below. If you’re completely new to Branded Searches in GMB Insights, we’d recommend reading the original article first (at the bottom of this page) and then the clarification, that has been vetted and approved by two Google representatives, that appears above it. A few weeks ago, Joy Hawkins and I published posts on the same day about Branded Searches, the new metric in Google My Business Insights. I wanted to return to that topic and clear up at least some of the confusion surrounding our differing explanations for what the metric means and how it is calculated. In my post, I wrote that Branded Searches referred to searches for a brand term that is different from your business name and that triggers your listing as part of a local result. Joy, on the other hand, defined them as searches that contain the name of a brand and trigger a list of results, as opposed to Direct Searches that trigger a Knowledge Panel. I’ve sought more information from the Google contacts who provided me with my original explanation, and I’ve looked more closely at examples from our client data as well. At this stage, I believe there is a grain of truth to both explanations, though Joy’s was perhaps more helpful in explaining the real purpose of the Branded Searches metric. The most important correction to my earlier post is this: Branded Searches are not only counted when someone searches for a brand term that is different from your business name. Rather, Branded Searches include cases where someone searches for a brand by name, whether that brand references a product or a store, and whether your listing is actually associated with the brand or not. Except for Gibson Guitar, each of the listings in the result above matches the search query because of a brand carried by the business, rather than because of the business name. Here, Google has only one local result to offer, so it presents me with a Knowledge Panel. But I haven’t searched for a specific business; on the contrary, I’m interested in finding any business that carries Gretsch brand guitars. It seems to me more likely in this case that Google would count “gretsch guitars near me” as a Branded Search for Lightning Joe’s Guitar Heaven, rather than a Direct Search. In this case, Google appears to have failed to recognize that Martin is a guitar brand, so it defaults to interpreting my query as one for a “Guitar store” where “martin guitars” is a keyword of some kind, but not specifically a branded keyword. Much has been made in recent months of Google’s shift toward the concept of “entities,” and I think brands are one more example of this. Google understands that certain keywords relate to an entity called a brand and is attempting to call these out separately in GMB Insights. If it appears to be more likely that the searcher is looking for a specific location of a brand store, that search will probably be counted as direct. Otherwise, any search for a brand term that produces any kind of local result is probably going to be counted as branded. That’s likely true whether the brand has anything to do with your business or not. I mention this because I see cases where Branded Searches are being counted for standalone businesses that are not brand stores and do not carry any branded products. In these cases, brand terms appearing in the “Queries used to find your business” list — such as, in one example, “abercrombie & fitch locations,” “buy buy baby near me,” and “money mart locations near me” for a local gift shop — are probably being counted as Branded Searches, even though they are not actually related to the business at all. Also, Google has since shared with me some of the rationale for creating the Branded Search metric in the first place. My contacts have explained that these searches used to be counted along with generic keywords as part of the Discovery Searches category, but the Google team felt this was not accurate, so they created Branded Searches to split out cases where search keywords were brand-specific. I should note that in traditional SEO and search marketing, a “branded search” is any search for your business by name, whether or not your business is a recognized national brand. On the basis of that definition, one might infer that Branded Searches in GMB also include searches that reference your business name but not your specific location. However, I tend to think Google is using a more entity-based definition of “branded” in this case, rather than the traditional SEO definition. In fact, in the examples they recently sent me, listed below, you will note that searching for an SMB by name is specifically called out as a Discovery Search, not a Branded Search. Before I close with Google’s examples, I’ll just state that I’ve deliberately used the words “likely” and “probably” a few times in this post, because it is clear that even within Google the concept of Branded Searches is somewhat difficult to pin down. I’m offering here the version of things that makes the most sense to me given the available evidence. 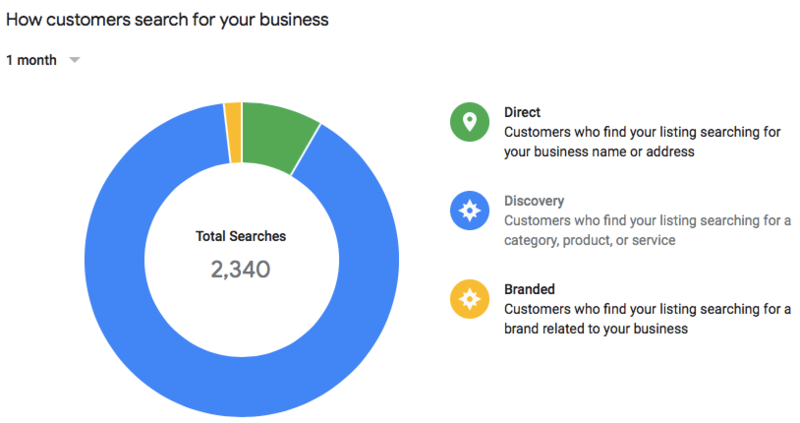 As reported last week over at Search Engine Land, Google has updated the search queries portion of Insights in the Google My Business (GMB) dashboard to include branded searches, a new category designed to capture instances where a Google user searches for a brand by name. If your listing has turned up for at least one branded search, Google will show you the branded search category as part of the Insights section titled “How customers search for your business,” as shown below. This update should be live soon for all GMB dashboards, but the branded search metric has thus far not been added to the GMB API. As with many Google updates, the company likely wants to test the usefulness and adoption of the feature in one area first, before deciding for sure if it will stick around. If you’re a little confused about branded searches and how they’re different from direct searches, here’s an explanation helpfully confirmed by my contacts at Google: Branded searches relate specifically to brand names that are not the same as your business name. For clarification, see the table below. As you can see, some direct searches could also be considered branded searches, whereas others, such as “pepsi,” could be thought of as being more like a ‘discovery’ search: the user is searching for a keyword that may be an attribute of a business, rather than for the business itself. The simplest way to understand the distinction is to remember that any search for a brand name that is different from your business name will be counted as a branded search. Google considers a “brand name” to be the name of any business with ten or more GMB listings. Google says the metric is largely meant to be useful for purposes of competitive analysis, helping businesses understand how often they appear in searches for their competitors. 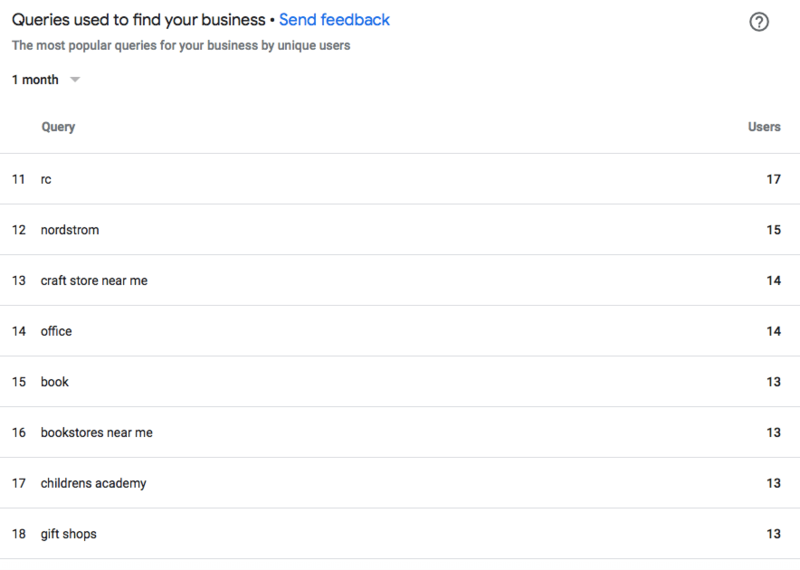 To see what branded terms Google users are searching for, you can check the “Queries used to find your business” section in Insights. See “nordstrom” and “childrens academy,” for example, in the list below for a local bookstore. It’s worth noting that branded searches don’t yet appear as a category on the overview page for each GMB location, where other Insights metrics are featured. No doubt this is further evidence that Google considers the metric to be somewhat experimental. As to the usefulness of the branded search category for competitive analysis, in order to emphasize that use case I think Google needs to do a little more work to clarify the metric for ordinary users. After all, despite my explanation above, one must acknowledge that “branded search” sounds like it refers to searches for my brand, when in fact Google intends something like the opposite. So too, many search terms that Google seems to count as branded—such as “nordstrom” and “childrens academy” in my example—may in fact refer to businesses that are nearby but not competitors. Google could do a much more targeted version of competitive analysis, perhaps built on this foundation, that would provide more obvious value to the ordinary business owner. Damian Rollison is VP of Product at Brandify, a company that provides location technology solutions to many of the world’s best-loved brands. You can follow him on Twitter at @damianrollison.